Renault FT modèle 1917 at Camp d'Oberhoffen in 1918. Most of the tanks in view are har à canon 37; armed with a 37 mm Puteaux SA18 short-barreled gun. Another version was armed an 8mm (.31 caliber) machine gun (Char mitrailleur). FT-17 tanks were the first modern tank with the crew forward, a rotating turret, and engine in back would become the standard layout of almost all future tanks to the present day. Over 3,500 were manufactured during World War I and saw combat with French and American forces. Between the wars, tanks were supplied to Poland, Finland, Estonia, Lithuania, Romania, Yugoslavia, Czechoslovakia, Switzerland, Belgium, The Netherlands, Spain, Brazil, Turkey, Iran, Afghanistan and Japan, influencing tank design for decades. 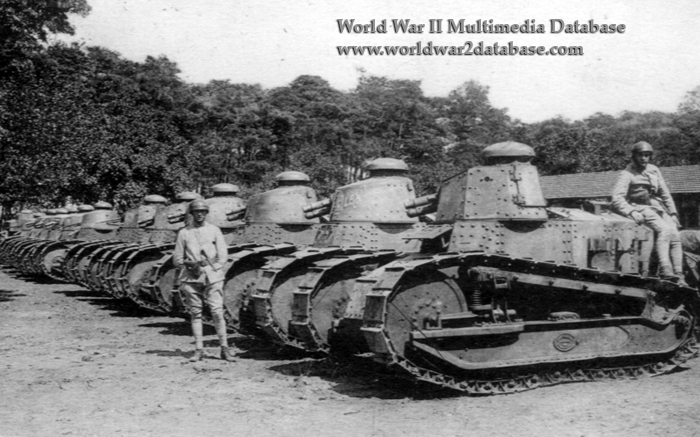 The United States manufactured 950 FT-17s as the Six Ton Tank Model 1917. Poland assembled a few dozen unarmored "iron" FT-17s as training tanks from spare parts. Poland's 112 FT-17s fought the Germans in September 1939. France supplied Finland with FT-17s during the Winter War. While mechanically unreliable, France still had 1,600 FT-17s in 1940, with 560 in front-line use. After the Fall of France, Germany sent FT-17s to be used as police vehicles and removed the turrets to be emplaced in fortifications. Camp d'Oberhoffen was designated part of Germany when Bas-Rhin was incorporated into the Reich in 1940; it served as a German military post during World War II.